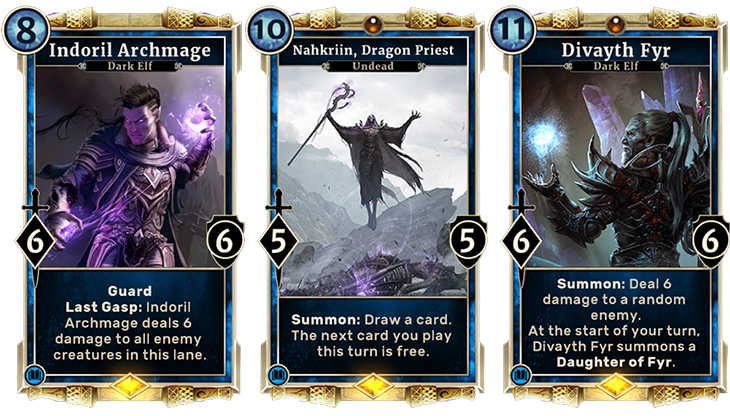 Now that we’ve covered some of the basics of deck building in The Elder Scrolls: Legends, it’s time to dig in a bit deeper with some advanced strategies including the different deck archetypes that frequently exist within card games. This should prepare you to dive right into deck building when the time is right. There are typically four different categories a deck can fall into: aggro, midrange, control and combo. In card games, aggro decks are the fastest or, aptly, most aggressive decks. Aggro decks typically load up on small creatures with the intent to play multiples of them every turn. Players who use aggro decks typically have no intention of reaching the later stages of a game. Instead, they hope to win long before then – so they often avoid more expensive cards unless those cards are also particularly aggressive. Wood Orc Headhunter is a great example of this, stating that if you have another friendly Orc, it gains Charge. Charge creatures are a great way to deal damage out of nowhere before giving your opponent a chance to deal with them, so aggressive decks are usually quite fond of them. Silvenar Tracker is another great Charge creature that allows you to take the initiative, a strategy we’ve mentioned before. Having the initiative here means you can directly attack your opponent for some damage with the Tracker, forcing the opponent to use their attacks to deal with the Tracker on their turn. This is typically how aggro decks thrive: by consistently applying pressure while denying the opponent the ability to do the same, as they’re too busy dealing with your threats. Control decks are on the opposite end of the spectrum from aggro decks. Control decks are slow and steady and look to, well, control the game from beginning to end. Control decks are good for drawing extra cards (the more resources you have, the better! ), dealing with multiple creatures at once and playing fewer win conditions. This often means the control deck will only utilize a few creatures that further a player’s game plan. For example, a control deck might include cards like Indoril Archmage, Dragon Priest or Divayth Fyr at the very top of its magicka curve to close out the game. With a control deck, health is your most precious resource. You’ll need to watch it carefully if you’re planning on staying alive until the late game. This means that creatures with Guard and cards that deal damage to multiple creatures – like Fire Storm and Arrow Storm – are your best friends. If you’re considering a control deck, it’s essential to look at what other players are doing with popular decks, so you can focus on countering their strategies. Midrange decks fall somewhere in between control and aggro. They have a little bit of aggression and a little bit of control, but they are primarily designed to play the most efficient cards at every point on the curve. These decks usually contain a lot of creatures and spells that provide card advantage (that is, dealing with or gaining more cards or resources than you expend). Midrange decks are often the most straightforward of the archetypes and also the most common. They tend to offer the most flexibility and consistency, as they don’t force you to focus your game plan at any particular point in the game. Combo is the final archetype, and it’s definitely the most unique. When we refer to combo decks, we’re not simply suggesting that you have both creatures and items in your deck. Instead, we’re talking about something that’s much more intricate. The combo archetype typically includes two- to three-card combinations that will occasionally be able to win the game on the spot. Sometimes, however, they take more moving pieces and you might build your entire deck around a particular interaction or card. If built correctly and working properly, combo decks can often end up winning the game in a single turn thanks to one powerful setup. When building your deck, you may want to eschew the typical deck building conventions and focus on a particular synergy. In terms of card games, synergy relates to the degree of interaction that cards have with each another. 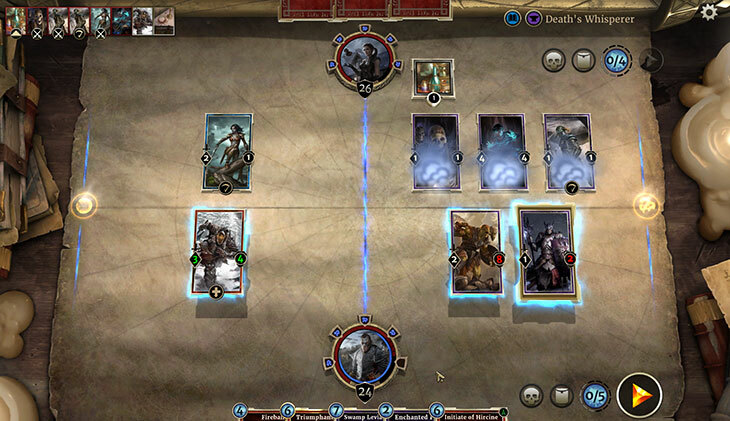 There are several races in The Elder Scrolls: Legends that reward the player for focusing on them (like an Orc deck that relies on the different bonuses Orcs give one another), and doing so in great number should help you produce a formidable deck with numerous bonuses. Highly synergistic decks like these end up being closest to the midrange archetype, as you often want to jam as many copies of synergistic cards into them as possible. The categories we’ve mentioned are some of the most common classifications your deck can fall under in The Elder Scrolls: Legends. Before you begin deck building, you should make sure to figure out what your deck is trying to do, then pick the archetype or strategy that best fits your plan. This should make constructing your deck a whole lot easier.